Tradition has always been part of the theatre. The Gypsy Robe is just one more, for the singing and dancing chorus in a Broadway musical. First let me define what the word "Gypsy" has to do with Broadway. Members of the singing and dancing chorus, if they are lucky, go from one show to another, never staying in a show forever. If they are in a touring company, they live out of their suitcases. They feel like the gypsies of old. The Gypsy Robe tradition started October 12, 1950, when Call Me Madam, starring Ethel Merman, opened on Broadway. At the time, Gentleman Prefer Blondes was New York's long-running smash hit of the day. Hoping to relieve the opening night jitters for the cast of Call Me Madam, a dancer in the company of Gentlemen Prefer Blondes sent a tacky dressing gown to a dancer in Call Me Madam with a note, "That this Legendary 'gypsy robe' has been in the theater for generations and brought with it great good luck." Call Me Madam was a great success. A rose from Ms. Merman's gown was added to the robe and it was sent to the next Broadway musical's opening night. Since 1950, with many hits and misses, many robes have seen their day. The old robes are not discarded. One is in the Smithsonian Institute's National Museum of American History. 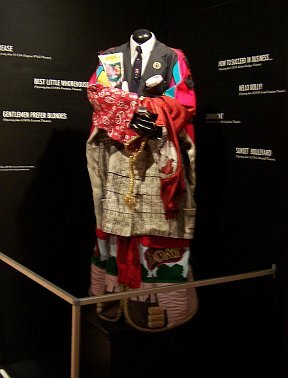 Some of these robes can be seen at the Dance Division of the New York Public Library and one is on constant display at the office of Actors' Equity. The others are stored and in the good hands of Terry Marone, protector of the robe and the tradition. According to Terry Marone, in recent times a ceremony is performed with every new opening. On opening night of a new musical this ritual takes place. The robe is presented to the gypsy chorus member with the most Broadway credits. The Gypsy Robe goes only to Broadway musicals with a chorus. The robe goes to a chorus member only, the one with the greatest number of Broadway credits. It is to be delivered one-half hour before the opening night curtain to the member selected. The new recipient must put on the robe and circle the stage three times while each cast member reaches out and touches the robe. Then the new owner of the robe must visit each dressing room while wearing the robe. The new recipient will then add a memento from the show to the robe. The opening night date is written on the robe near the memento and the cast members only sign that section of the robe. A robe will represent 20 shows. The new owner of the robe must determine when the next Broadway musical is opening and, through Equity, locate the gypsy with the most musical credits. It will be their responsibility to deliver the robe to the next Broadway musical's opening night. This tradition has been going for over 50 years and many, many Broadway musicals have come and gone.